The Eurogroup of Eurozone Finance Ministers has finally agreed to begin discussions on debt relief for Greece. However, initial proposals developed by the European institutions do little to address Greece’s debt problems. Meanwhile, the reckless lenders who ultimately received 92% of the bailout loans to Greece would continue to avoid having to make any contribution. The Eurogroup proposes spreading out when debt payments from 2020 are made to Eurozone governments, capping the interest rate charged on Eurozone loans (at a level above the current interest rate), giving profits the Eurozone bailout funds are making from Greece back to Greece, and lending more money to Greece in 2018 to repay the high interest IMF loans. In total, the Eurogroup’s own analysis shows that these measures would not have any impact on debt payments between 2016 and 2018. After this they predict the measures would save Greece 11% of debt payments in 2019, rising to 29% by 2022, and 31% by 2050. Though this would be at the cost of pushing some debt payments even further into the future. 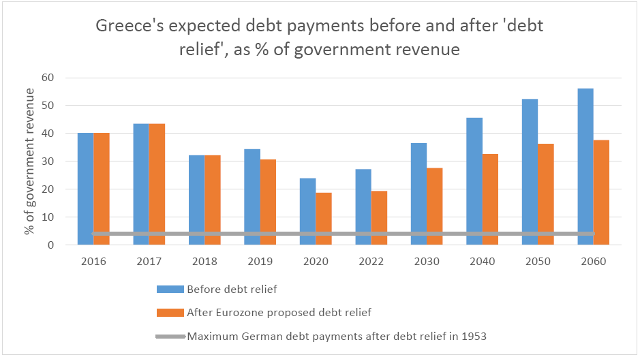 However, this would still leave Greece with extremely high debt payments, of 30% of government revenue in 2019, just under 20% in the early 2020s, then rising back over 30% after 2040. In contrast, in 1953 Germany had half of its debt cancelled by countries including Greece, and payments on the remaining half dependent on the country earning a trade surplus with the rest of the world. The impact of this was to limit debt payments to under 4% of government revenue. The proposal is effectively the same strategy as for the last six years, pushing burdens into the future, whilst failing to address the root cause of Greece’s economic collapse, that there is too much debt. The same strategy was tried in much of Latin America and sub-Saharan Africa in the 1980s and 1990s, exacerbating the debt crises faced by many countries and leading to two ‘lost decades of development’ and big hikes in poverty and inequality. Many countries were only freed from crisis either when they defaulted on their debts, or when it was finally accepted that a significant amount of the debt owed needed to be cancelled. It has been reported that the IMF do not regard the initial European proposals as going far enough. Instead, they are said to be pushing for the interest rate on Eurozone bailout loan to be fixed at the current 1.5% rate, and for principal payments not to begin until 2040. This would save Greece around €6bn to €9bn of payments a year from 2023 to 2040, cutting payments by another third. However, it would once again do nothing to help Greece address the humanitarian crisis that it is facing now, and which is likely to continue over the next few years. For Greece’s current debt crisis to be overcome, debt payments need to be reduced to two creditors which both the IMF and Eurozone refuse to talk about – the European Central Bank (ECB) and IMF itself. Together the IMF and ECB account for 55% of Greece’s external debt payments between 2016 and 2019. Moreover, the IMF and ECB are actually making money from their loans to Greece. We have predicted the IMF, because of the high interest rate charged, will make €4.3 billion of profit from Greece if it is repaid in full. The ECB could make €10 billion to €22 billion profit as it bought Greek debt cheaply when markets expected Greece not to pay, but is being repaid in full (though some of this may be returned to Greece under the current debt relief proposals). For debt relief for Greece to be just and meaningful, it needs to involve a dramatic and immediate reduction in debt payments now to enable Greece to tackle its humanitarian crisis. It needs to actually cancel debt, rather than once again kicking the can down the road. Only immediate debt cancellation will bring back the confidence and fiscal space needed to enable economic recovery to take place. The debt cancellation needs to include all external creditors, and it needs to recover the money from the banks and speculators who benefited from the bail out loans to Greece, rather than putting the cost on ordinary Europeans.